Since smartphones are often considered almost as important as knives, guns, and flashlights as part of a personal EDC, it’s time to consider other technologies beyond the usual stuff. Surefire is always full of bright surprises just as they are loaded with cutting edge technology to serve our lighting needs whether reading a map or clearing a cave. Surefire is well known as the maker of some of the world’s best flashlights, but recently they have let some of their lighting magic seep into the world of smartphones. With Surefire’s new “FirePak Smartphone Video Illuminator + Charger” lighting system, you can carry a blinding light, a cell phone charger, and a lower lumen general lighting solution. By blasting up to 1500 lumens of light onto a questionable subject. That’s like flicking on a 100 watt light bulb in their face! The Surefire FirePak was designed for the “millennial” smartphone user so their videos and selfies can continue its madness into the deep night. The lightly rectangular block named the “FirePak” contains a large rechargeable battery, two USB ports (one for charging itself, one for charging other devices), a sliding multi-position switch, a battery indicator light, and most of all two forward-facing LED lights. What’s unusual about the pair of LED lights is they have asymmetrical 10mm reflectors. with one offset in one direction and the other offset 180 degrees. This combination of lights produces full-frame illumination specifically designed for a smartphone’s 16:9 HD aspect ratio. In other words, the FirePak lights up a rough rectangle that is proportioned to what the cell phone camera sees. No wasted light, no dark spots or vignetting. So blasting bad guys or questionable scenes is a simple job for the FirePak. A side advantage of the FirePak is found when it is actually used for making cell phone videos. Slo-mo can take advantage of the clean flicker-free lighting that is modulated so it does not interfere with the shutter speed of a digital camera or cell phone camera. The Surefire FirePak has a six position switch, off—on (but no-light)—low—med low—med high—high. When on but no-light, the light output can be controlled by the App up to 10 meters away (which has it’s own set of advantages). The runtime for the FirePak on high output is about five hours. 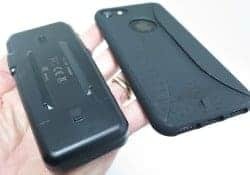 You might get about one and a half complete iPhone 7 recharges if the FirePak’s battery is used only for that purpose. And running on the lowest light output of 100 lumens, the FirePak should give about 10 hours of useful light off a full starting charge. Obviously there are many combinations of the above, but you can always head off to school with a full charge if you plug the FirePak into a wall outlet or computer overnight. And you can even charge the Firepak with a traditional external recharging cell phone battery such as any of those so popular today. The Surefire FirePak produces a bright stream of light that can easily reach out 20 yards or more when needed, or shine a spotlight on a local scene making closer subject stand out from the background. Light output is affected by the inverse square law meaning that the light’s intensity is inversely proportional to the square of the distance from the source. Double the distance between the light and subject and you have one fourth the quantity of photons of light falling on the subject. So brightness is relative. It takes a substantial amount more lumens of light to significantly change the scene brightness. The scale of lumens from 100-1500 of the FirePak is about four doublings of lumens. That’s a pretty good range from reading a book to putting a pretty big dent in the darkness around a campsite. 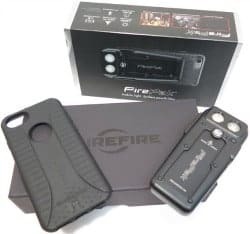 The FirePak is designed to be mounted to the smartphone using a slide-on docking attachment system that begins with a custom Surefire phone case. 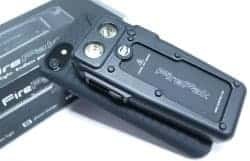 The dual-rail yoke on the back of the FirePak slides into a pair of slots on the back of the svelte phone case Surefire makes. It’s mostly held in place by friction, but there is a mild stopping block that locks the sliding. But overcoming the block and following friction to separate the two is done by just sliding them apart. The Surefire FirePak has an accompanying App called the Surefire FIrePak Illuminator that can be downloaded onto your phone. 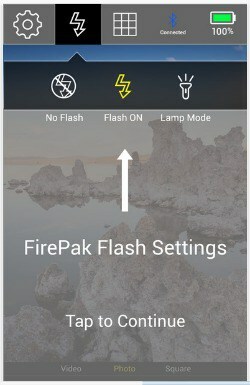 The App can talk to the FirePak via Bluetooth allowing some on-screen light control and customization. Additional features of the App include grid overlays for photo composition, tools for white balance, a self-timer, output levels, exposure brightness (ISO), and Bluetooth controls including battery percentage. But consider this option: you can place the FirePak about 30 feet from the phone and control its light output from off to 100 lumens to 1500 lumens. And because the connection is Bluetooth, you can do this kind of remote lighting anywhere in the world. For example, you are camping your bugout location. Before dark, you place your FirePak in to the side of your camp about 10 yards from your tent or bivy sacks. In the middle of the night, you hear a noise. Not a forest noise, but a predator noise. The two-legged kind. In the dark of your sleeping bag, you open the Surefire FirePak App and fire up your FirePak. Suddenly it’s daylight in your camp and even if the disoriented and now frightened intruder attacked the source of the light, you would be safely off to the side ready to take action. A more domestic use would be to run roughly the same scenario in your house. Night. Intruder. Blazing light anywhere. You, the hero. Being prepared means taking advantage of every advantage. The Surefire FirePak makes for a seriously new tangent in portable lighting. And I’m sure there are many more advantages that have yet to be problems. Surefire has proven itself over and over, so while the FirePak is only a relative of the flashlight, the light it spills is all the same. Just more of it.